You can buy ground pork and ground beef, mix them together and add this to the seasoning below, without the olive oil. Stuff this meat mixture into the quail. Or, you can buy any kind of stuffing and place that into the quail, as well. Either way, it will be delicious. This recipe requires at least 5 hours of marinating, so prepare this ahead of time then enjoy later! Mix all of the seasonings together in a bowl, then apply to the deboned, stuffed quail. Place the quail into another bowl, then add the Sciabica's Jalapeno Extra Virgin Olive Oil on top of the quail. Roll the quail around in the olive oil, then place into the refrigerator and let it marinate for 5 hours (you can marinate over night and cook the next day as well). Preheat oven at 400°F. Pour 2 Tablespoons of Sciabica's Sevillano Variety Fall Harvest Extra Virgin Olive Oil onto the bottom of a cast iron skillet. Place stuffed quail into the skillet and bake for 15 minutes. 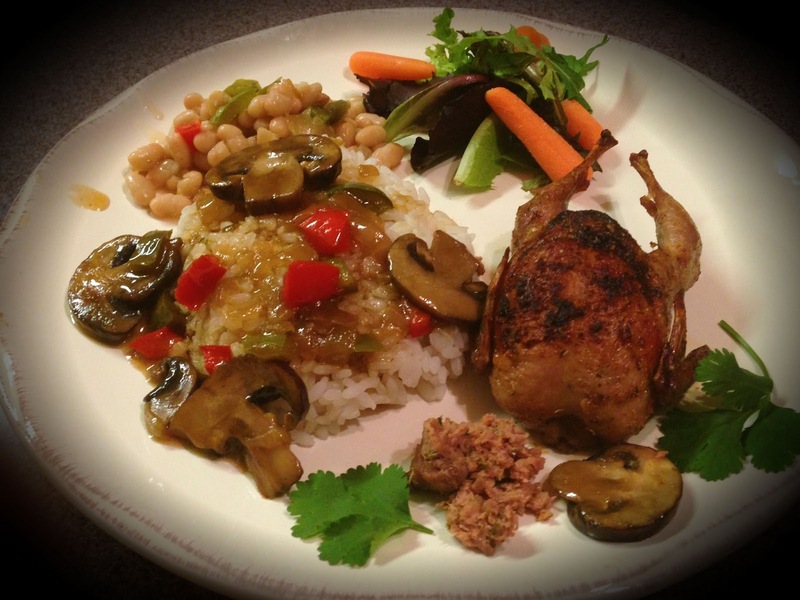 Once quail are cooked, remove them from the skillet and place them onto a plate and coat the quail with the honey. This makes a pretty glaze and adds a nice sweetness to the delicious quail. Now, leave the juices in the skillet and place the skillet onto the burner and brown the chopped onions and bell peppers until translucent. Then add the mushrooms and chicken broth, then cook down for 7-10 minutes. Now you have a flavorful gravy to add onto your rice to enjoy with the quail. I had a side salad with the Sciabica's Jalapeno Extra Virgin Olive Oil drizzled on top, with a dash of salt and black pepper.